Hello and welcome to Mad About Meghan, a blog chronicling the life and style of The Duchess of Sussex. Already a well-known actress thanks to her role in hit series Suits, Meghan was propelled to global fame in 2016 when it was confirmed she was in a relationship with Prince Harry. I wasn't at all familiar with her until then, but quickly became increasingly impressed with her poised reaction to the limelight she's now under, her humanitarian work, social conscience and her effortlessly chic style. Since 2011, I have been writing 'Duchess Kate', a blog I began in the days after the royal wedding. As a dedicated royalist with a keen interest in all things to do with the British Monarchy. As with William, I've always followed Harry's life and work closely too, which led to my interest in Meghan. I am incredibly excited to document Meghan's journey and to chronicle her work, life and style during the exciting years ahead. I don't know exactly how I got here. lol But I made it. yay. It's going to be very interesting to watch how things develop between Harry and Meghan. I guess time will tell if it lasts the distance. Found this through twitter and am very excited that you've started this blog! I love your Duchess Kate blog and will add this one to my daily check-in. Here's to a potentially new princess-to-be!! So glad you're doing this, Charlotte - you do such a great job with the Kate blog! Thanks! I don't think that's a selfish reason at all, Kara. I think it's unselfish because you want the best for your daughter. And the fact that you're already thinking about the impact her ethnicity will have on her is a lovely thing to read. I hope you participate in the blog. I'll look forward to reading your take, as you have a totally different one being a mother to a biracial child like Meghan. What a great story Kara Paulk! Meghan is such a wonderful person to follow! I knew this had to be your blog, Charlotte! I've followed your Duchess Kate blog for a few years now, and when I came across this, it felt such like your writing style! Well done! You have a true art with your ability to capture the goings on of the Duchess and now Meghan. Your blogs are so thorough and provide such a well-rounded perspective on style as well as the issues that the Royals are so passionate about. Best of luck with this blog! Can't I subscribe to a newsletter? Yes, absolutely. Can you see the 'Follow by Email' option on the top of the sidebar? I believe users with iPhones cannot. Could you please set up an RSS feed for the blog? I love following your duchess Kate one in my feed reader and would like to do the same for this blog, but it doesn't seem to be set up. I would like to ask you a question, but can’t seem to find an email link for you on the MadAboutMeghan blog...only your HRHDuchessKate blog! I absolutely love keeping up with your "Duchess Kate" Blog, and now this one. Thank you for all your efforts! I was just wondering why you have a black and white line drawing image of Meghan Markle at the top of "Mad About Meghan" homepage, and not an actual photo of her? Je suis tous les jours votre blog Duchess Kate, et maintenant celui de Meghan, merci pour toutes ces belles photos et informations. Auriez-vous une adresse à m'indiquer pour envoyer mes voeux prochainement au Duc et à la Duchesse de Cambridge,ainsi qu'à Harry et Meghan ? Do you have an address to write my wishes for the future birth to the Duke and Duchess of Cambridgeand to Harry and Meghan for their future marriage ? Hi! I love all the pics you have here. Just an observation: Meghan's turned up collar at the Commonwealth service looks unfinished. Possibly should not have been turned up. She looks so sharp, I was sad to see someone missed this wardrobe issue. Do any other readers see this? THat is the style of the coat, very French, very chic!!!! I absolutely enjoy your Duchess Kate blog. Glad to see this one too "Mad about Meghan" as well. Been fan of your Kate page for a couple of years and now a fan of your Meghan page. Your pics are amazing and beautiful and where I go first to see new ones of this great family. Thank you for all your wonderful work on both blogs. It has been refreshing to have a place to follow both ladies that has not descended into negativity and vitriol. and save image (without clicking download). useful for you for showing other Royal locations! Enjoy. Thanks for all you are doing. next best place to share these pictures. Charlotte this blog is a breath of fresh air! A break from the negative coverage that Meghan receives daily in the British tabloid press. 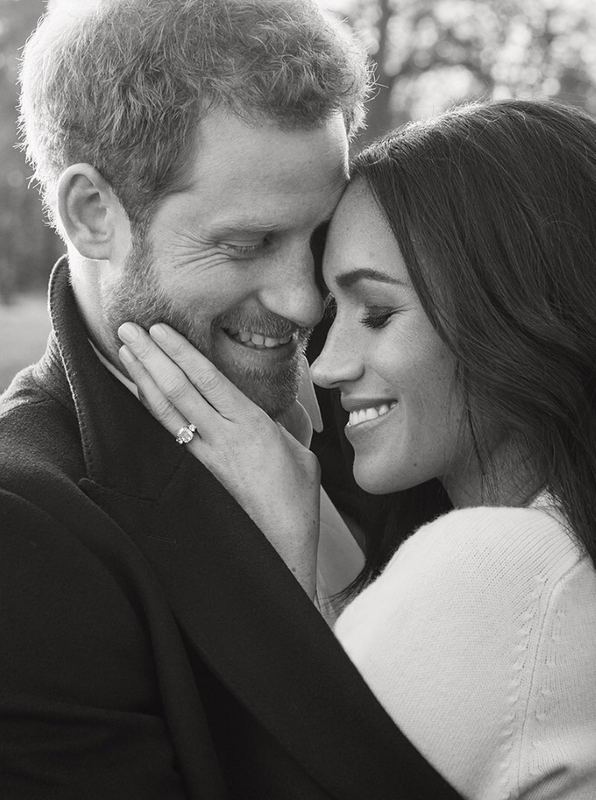 Rachel Meghan Markle, the new fiancée of Prince Harry, has much New England ancestry and millions of American cousins. Her father, Thomas Wayne Markle, through New Hampshire great-grandparents named Ellsworth and Merrill, has colonial ancestors in common with eight presidents – George W. Bush, George H.W. Bush, Gerald Ford, Richard M. Nixon, Herbert Hoover, Calvin Coolidge, Chester A. Arthur, and James A. Garfield and three First Ladies – Frances Cleveland, Ellen Wilson (Woodrow’s 1st wife) and Mamie Eisenhower. Other distant cousins of Ms. Markle through these New England ancestors, include poet John Greenleaf Whittier, writer O. Henry, lawyer Clarence Darrow, actor James Dean, Senator Sam Ervin of the Watergate hearings, singer and actor “Roy Rogers” (L.F. Slye), John Kerry, and Canadian Prime Minister Lester Pearson. As to the immigrant Christopher Hussey, subject of recent articles in the British press, his English origins are known but noble ancestry seems highly unlikely. One ancestor of Ms. Markle, however, is indeed of royal descent. He is Rev. William Skipper, who immigrated to Boston in 1639. A descendant of King Edward III of England (died 1377), Skipper was also a 1st cousin several times removed of Margaret Kerdeston (ca. 1426–after 1485), wife of a French nobleman, grandmother of a queen of Bohemia and Hungary, and an ancestor of most later European kings. Skipper ancestors Sir Philip Wentworth (died 1464) and Mary Clifford are ancestors also, in various lines, of both H.M. the late Queen Mother (and thus H.M. the Queen, the Prince of Wales, and Prince Harry) and of the late Diana, Princess of Wales. Because of royal intermarriage, Prince Harry is descended from Margaret Kerdeston in more than 240 lines, including at least four through King George III and four through Princess Diana. Thus, Margaret’s grandparents, Michael de Pole, 2nd Earl of Suffolk, who died in 1415, and his wife, Katharine Stafford, (died 1419), ancestors also of Rev. Skipper and Ms. Markle, make Prince Harry and his bride-to-be distant cousins in more than 200 ways. This ancestry and kinships of Ms. Markle reflect much of modern American, British, and European history. Related to millions of Americans and many Britons, including notables in both countries, Ms. Markle is perhaps the newest solidifying figure in Anglo-American kinship and American-British relations. This research on Ms. Markle’s ancestry was conducted by Gary Boyd Roberts, author of American Ancestors and Cousins of The Princess of Wales (1984), with assistance from Alex Bannerman of Charleston, West Virginia, with some data sourced from the websites famechain.com and AmericanAncestors.org.